French Line: SS France Art treasures onboard the France. 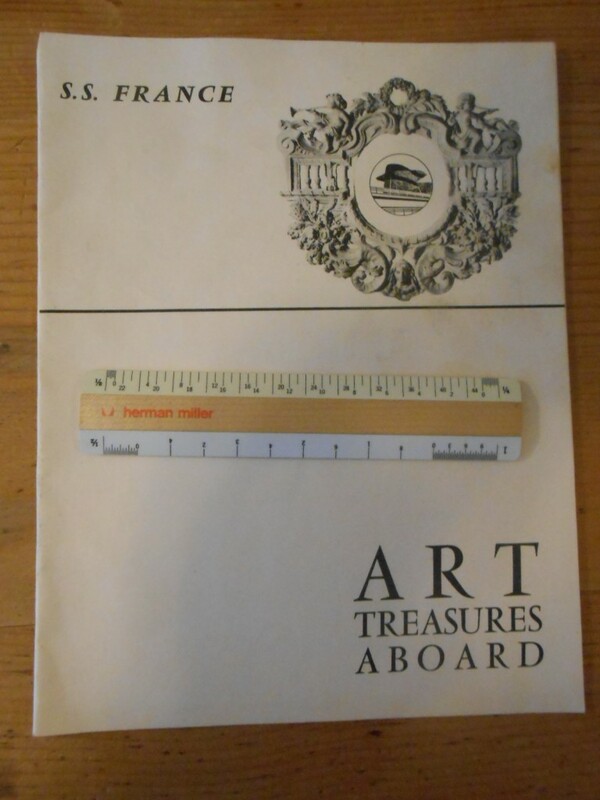 Lovely English printed list of art treasures onboard the ship. These are printed on a heavy paper folder (much line a menu) and the list covers many of the treasures you would find onboard in public spaces an suites. Wonderful item with minor scuffs to the cover. 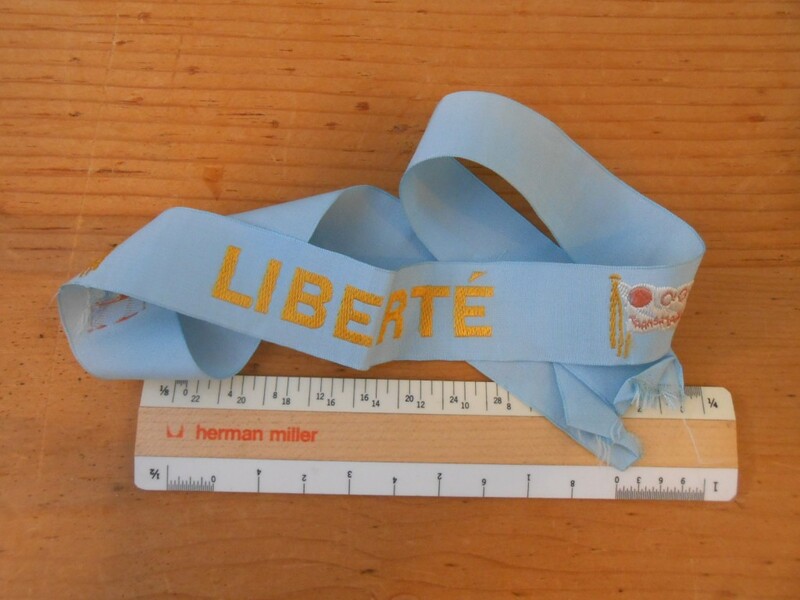 Lovely embroidered hat ribbon for the Liberte. She was the post war flagship for the French… given to the French Line a sort of a consolation prize fro the lost of the exquisite Normandie .. she had been the German Europa. 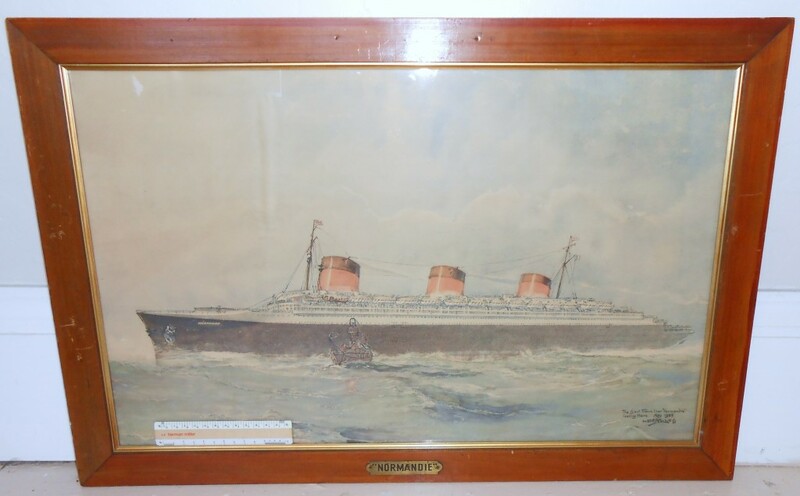 She was rebuilt and her interiors certainly took on a French deco feel… even some of the Normandie’s Artwork was reused onboard. Just a lovely ribbon in great condition! 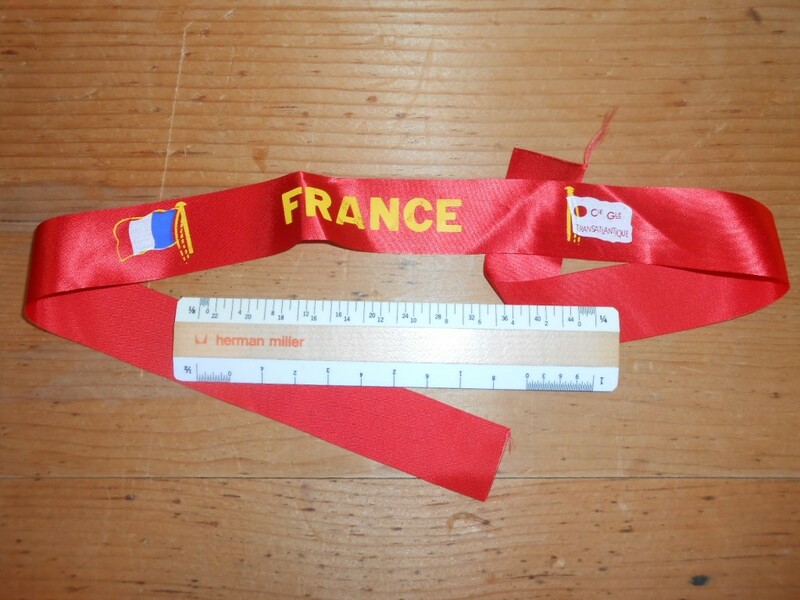 Cool Red ribbon souvenir ribbon for the SS France. These were popular items always available for purchase , but also at times given to passengers for special awards and or events. These were available in a wide range of colors .. this one is Red and in pristine condition! 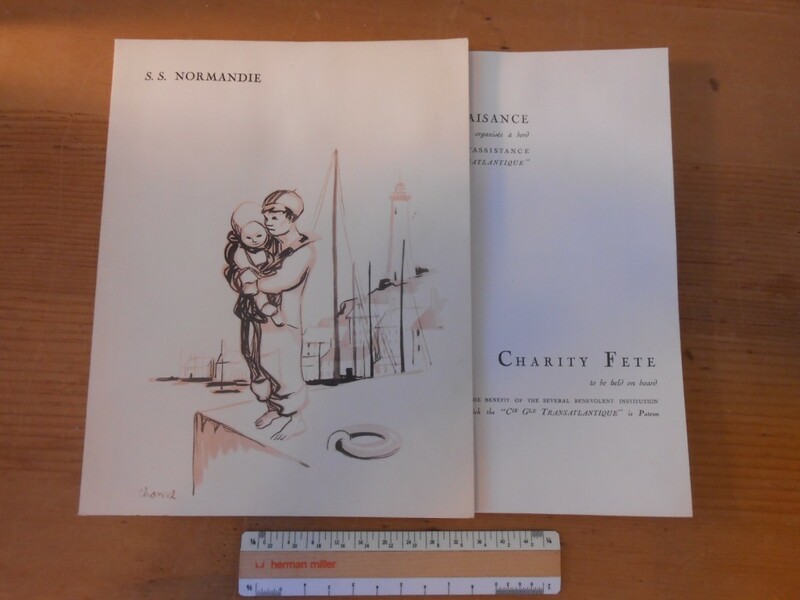 rare and cool charity program form the Normandie for June 25th 1935. This would have been on one of her first voyages. The entertainment took place in the Grand Salon (WOW) and a collection was taken up to benefit the French and American seamen’s funds. Comedian Vic Oliver was the master of ceremonies for the evening … events include singers, dancers, magic and other acts. The program which includes a cover and an insert is in great shape with maybe a slight little wrinkle to it .. though I will store it flat and I am sure it can be pressed. Rare indeed! 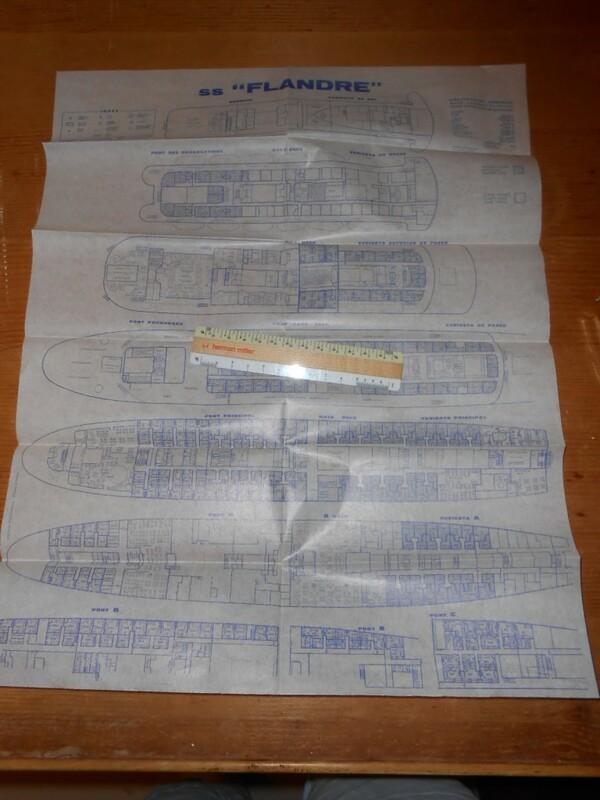 French Line: Flandre mini tissue deckplan. Great smaller onionskin tissue deck plan for the intermediate sized Flandre. She had beautiful 50’s modern French deco … and was a favorite of mine. Once sold by the French, she had several gigs… but burned when owned by Epirotiki as the Pallas Athena. Lovely little mini deckplan! 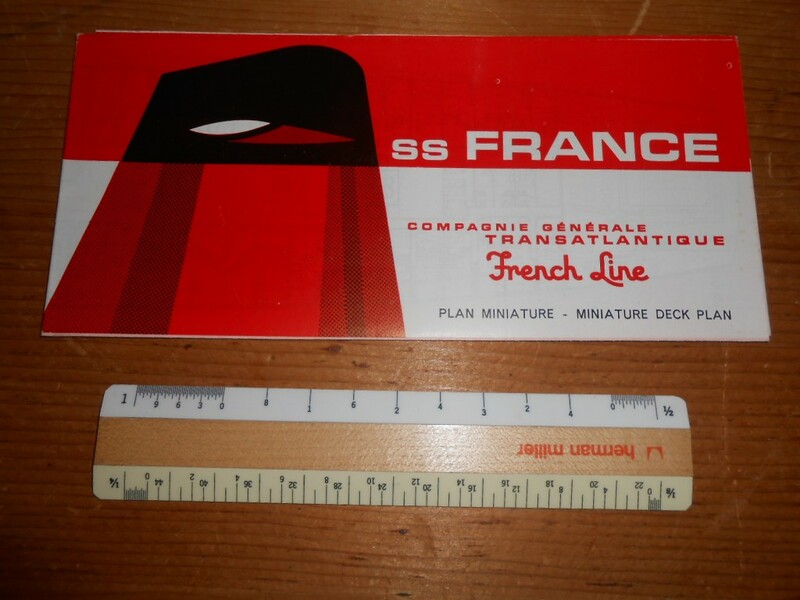 French Line: SS France miniature deckplan 1967. The France would have been on the Atlantic 5 years when this fine DP was printed. The glossy stock is nice and the text is in both French and English. And there is a Walnut Creek, CA travel agency stamp. The DP is in great shape! 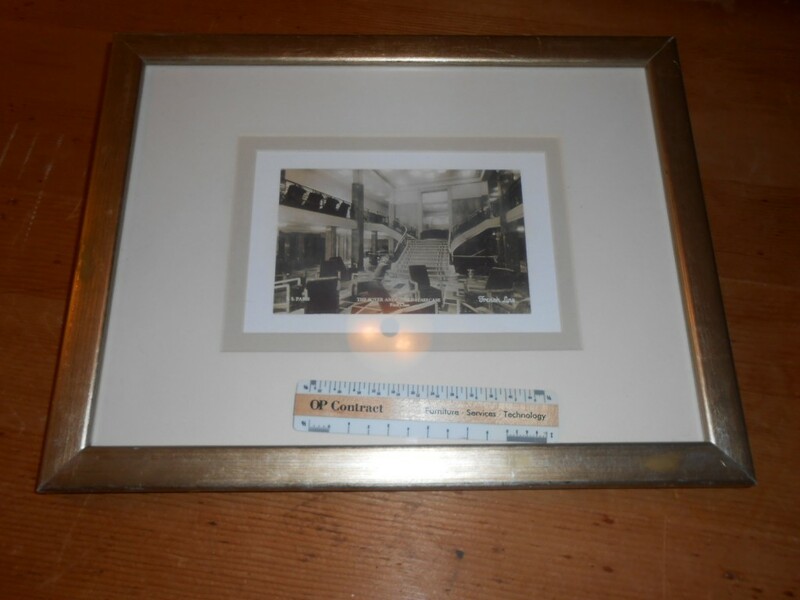 French Line: SS Paris Grand staircase interior framed photograph. Really cool interior photograph of the Grand Stairway/ embarkation hall of the lovely SS Paris. This room as shown was the later remodeled version, which was more Art deco is flavor and furnishings. The poor Paris had a few different fires … and Her career was ended by an enormous blaze before WW2 erupted. The gold n silver painted wooden frame has a few nicks and scrapes … but it is a wonderful and unique item! Pretty sure this is a modern print that had been framed … framing dated in1998. 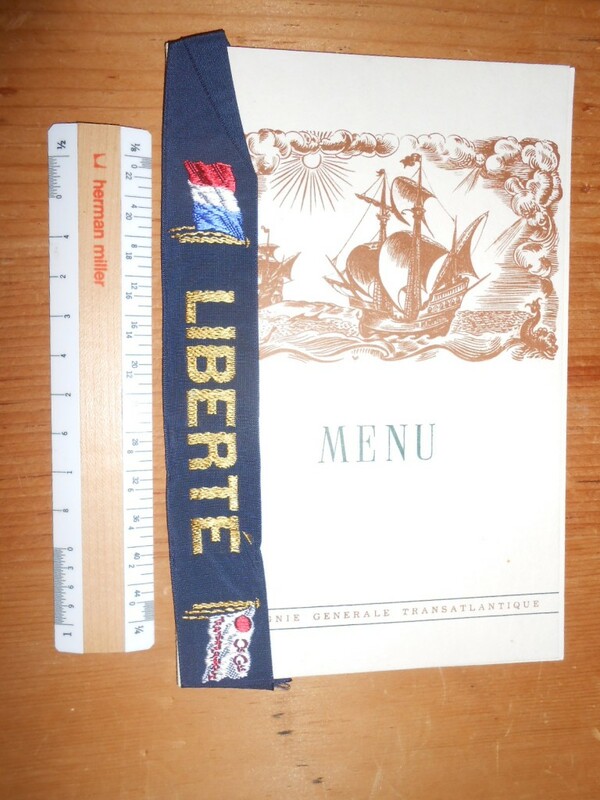 Commandant Jean Comilia was in charge of the mighty Liberte when a creative passenger wrapped their souvenir hat ribbon around this dinner menu. The red hat ribbon could have been a gala night gift, or a purchase from the onboard gift shop. Both the menu and ribbon are in great shape. From December 1957. Great little December 1957 dinner menu a creative passenger wrapped a hat ribbon around years and years ago. The back side of the menu was signed fellow passenger. The black hat ribbon could have been a gala night gift, or a purchase from the onboard gift shop. Another totally amazing design rendering done for the SS Paris. 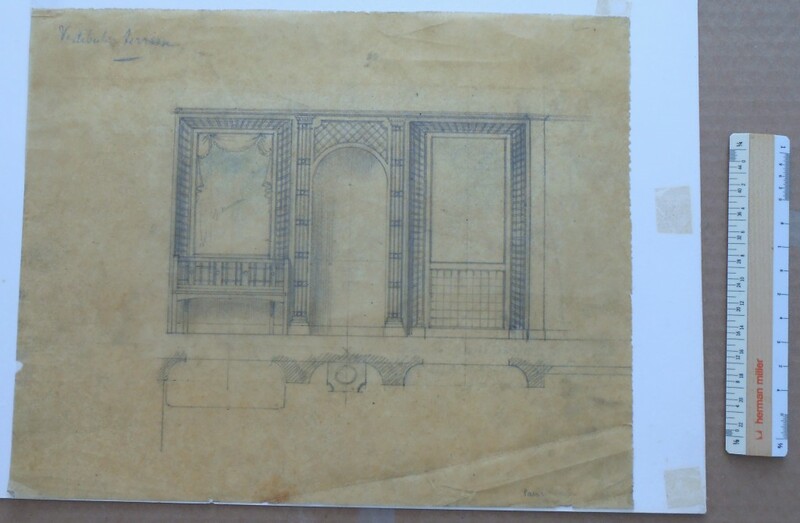 The rendering itself is done in pencil and ink showing a detailed elevation and section study of a wall niche for a Vestibule Terrace . These renderings would have been part of the designers concept portfolio for the proposed work onboard. I know I have seen this same rendering shown in print someplace … but alas I can’t remember. It is not in Rene Vian’s masterwork book: Arts Decroatifs A Bord des Paquebots Francais … like the other rendering I am offering for sale. The Paris herself was remodeled a few different times from her Beaux Arts and Nouveau beginnings into more of an Art Deco lady … most of the major changes happened after her first big fire in 1929. A pretty rare “one of a kind” elegant item. 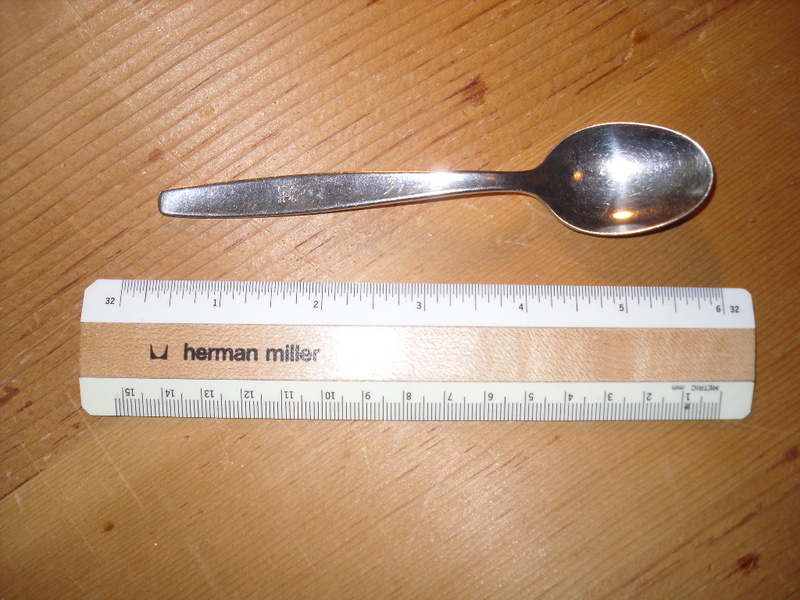 This item is totally amazing …. A wonderful interior design rendering for the SS Paris. 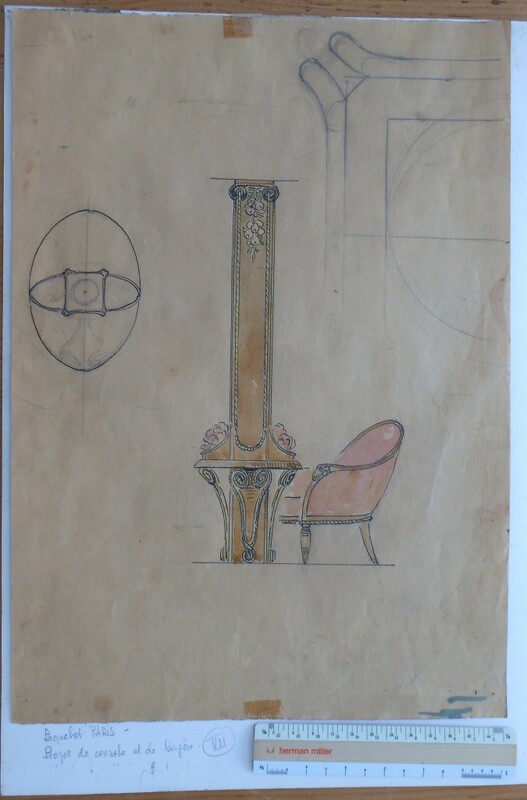 The rendering itself is drawn in ink and gauche and shows a detailed elevations/section/plan study of a column w/ shelf design that for the Grand Salon. These renderings would have been part of the designers concept portfolio for the proposed work that was presented to the French Line. Another rendering in this exact same series was shown in Rene Vian’s masterwork book: Arts Decroatifs A Bord des Paquebots Francais (page 58). It is in beautiful condition, and would be just stunning framed. Certainly rare to find something like this that has provenance in a MAJOR and exceptionally well done publication. I can include a copy of page 58 if you like. 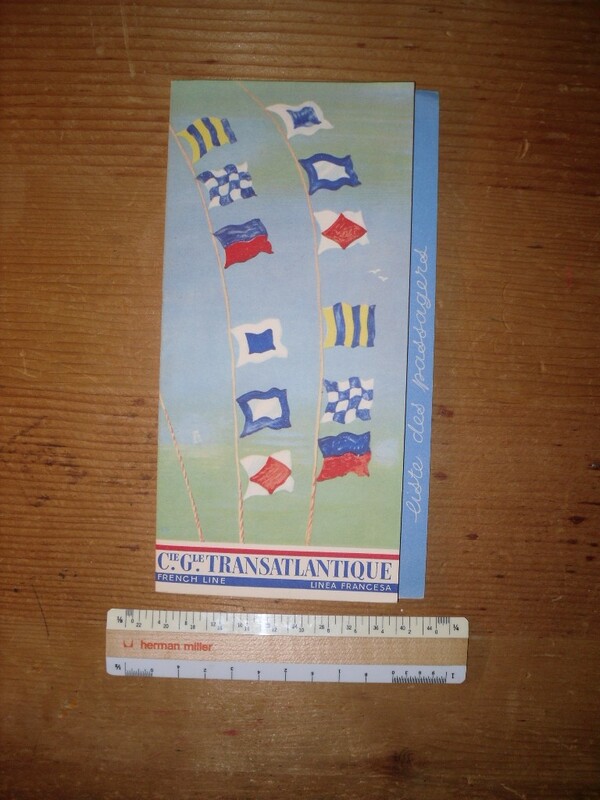 French Line: Normandie Sebille agency print. A favored souvenir item for all French lines ships were these commemorative medallions… the onboard gift shops were loaded with them! The casting details on this one is just marvelous, one side is the liner Flandre in profile, the other side is “Flandre” as a personified female figure. 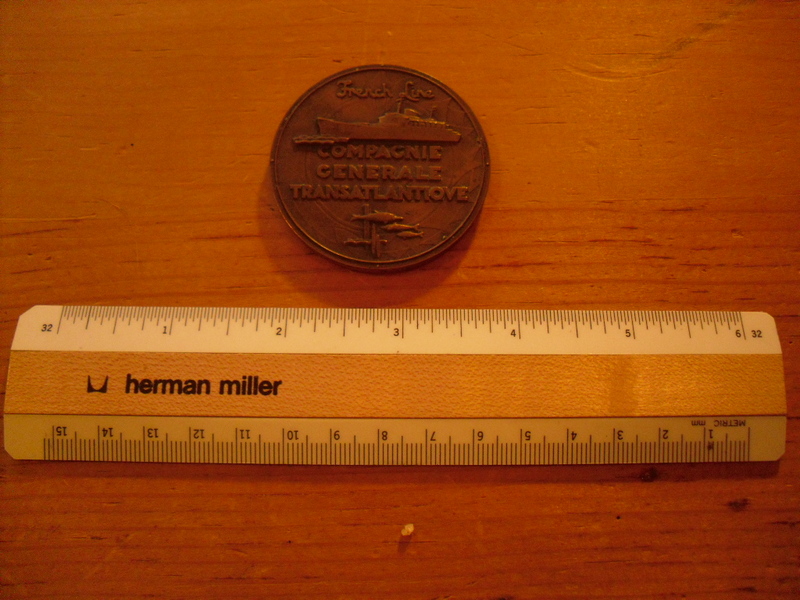 This one is in great shape … just no longer has the round “pillbox” container it would have come in when purchased. Just found this one in a drawer this past week. 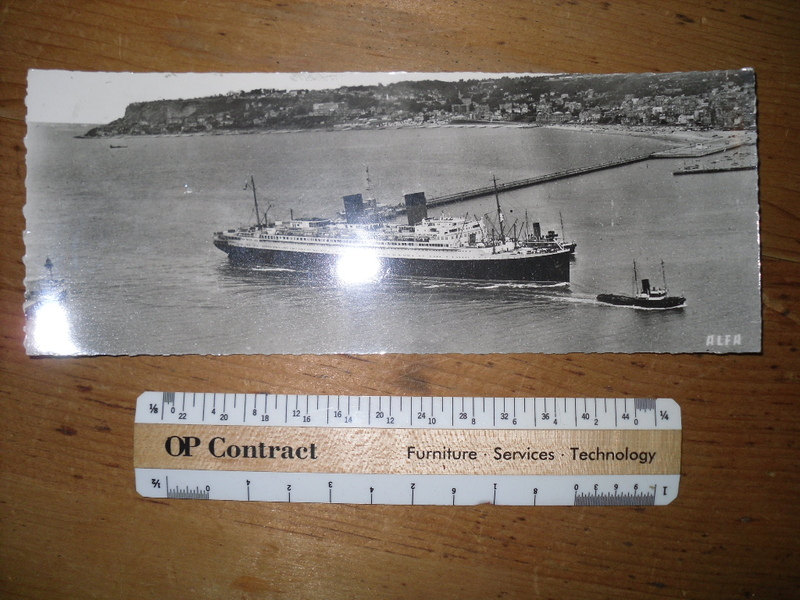 Other than her Maiden voyage … the Rio Cruise of the Normandie was probably her most interesting and publicized voyage. 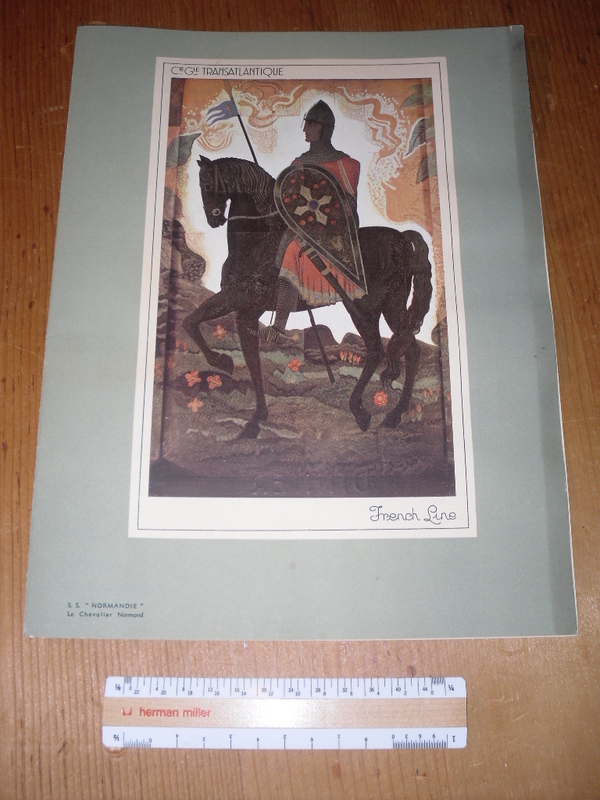 This is a huge chapel “knight” oversized menu from Washington’s birthday Feb 22nd 1939. There were not many months of peacetime left in the world at this point…WW2 was looming on the horizon. I am sure all that seems distant to most of the folks onboard as they celebrated and enjoyed certainly one of the best designed liners of all time. There is a little fading/discoloration noted to the edge of this menu. Full of delicious eats! Should be pressed flat in a book … does have a little wave to it .. but still rare and lovely! It was a very special occasion with momentous celebration when the Norway visits Le Havre in 1996… this was her first time in her old home port since 1979. The French never wanted to give her up in the first place… but the Norwegians certainly gave her a long extended life as the Norway. … and always used the prestige of her storied past in their brochures. 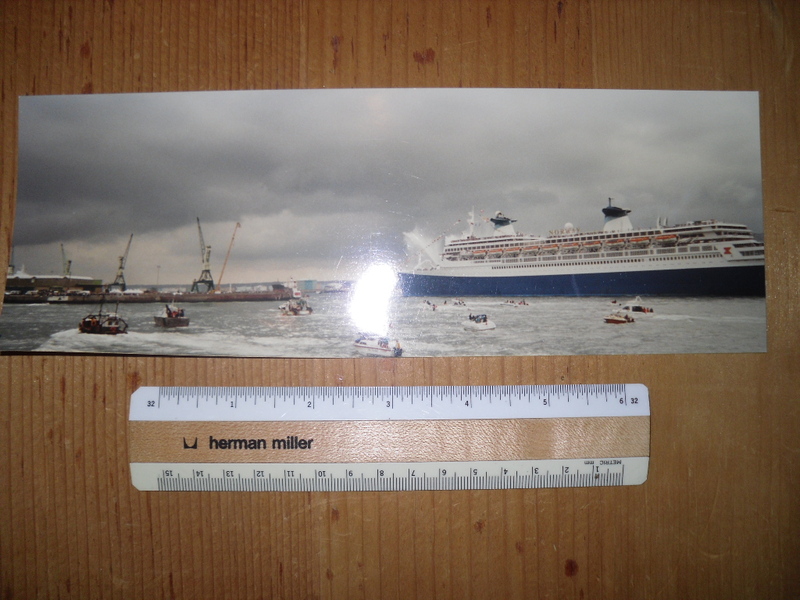 This is an original panoramic photo…artist signed. A wonderful view of the Liberte near Le Havre harbor. 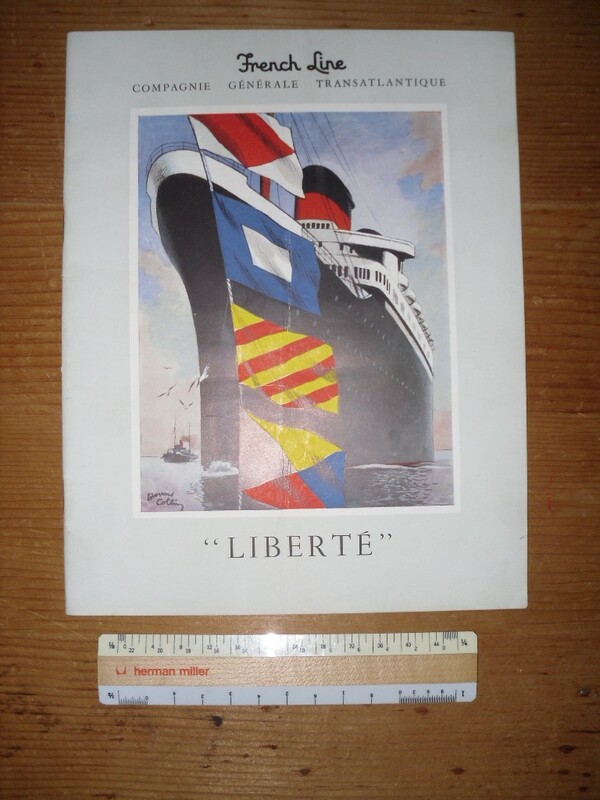 I love the Liberte a lot … wish she would have lasted a little longer and been used at the Seattle Worlds Fair as a hotel ship. Think of all the neat things that could have made there way off her in Seattle and been saved for us future collectors! 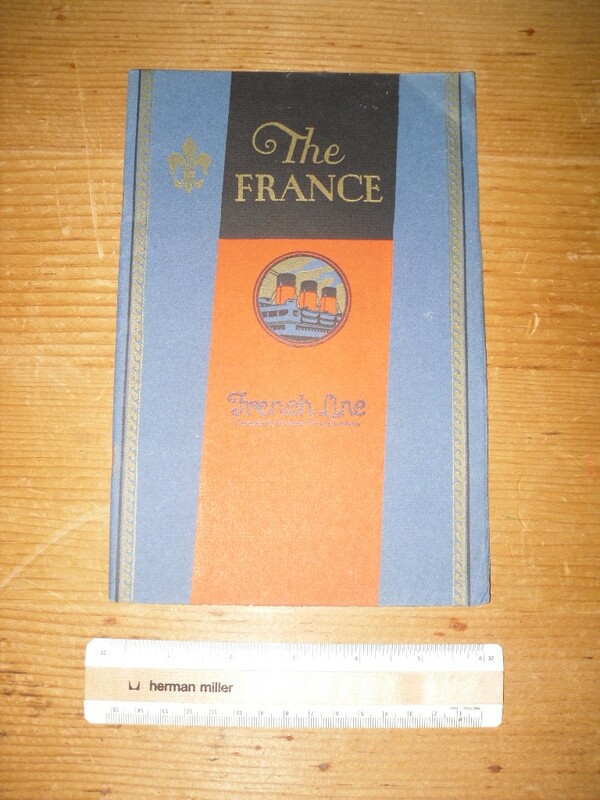 French Line: Ile De France. One of my favorite ships for sure! pre war she was the design trend setter, during the war she was a trooper workhorse and after the war she was a stylish life saver. 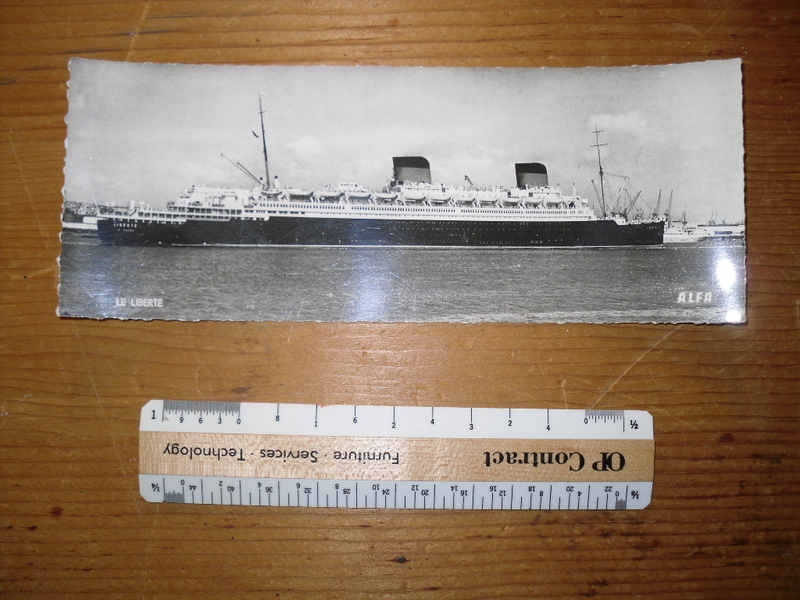 This deckle edged postcard shows her in the LeHarve breakwater post war. 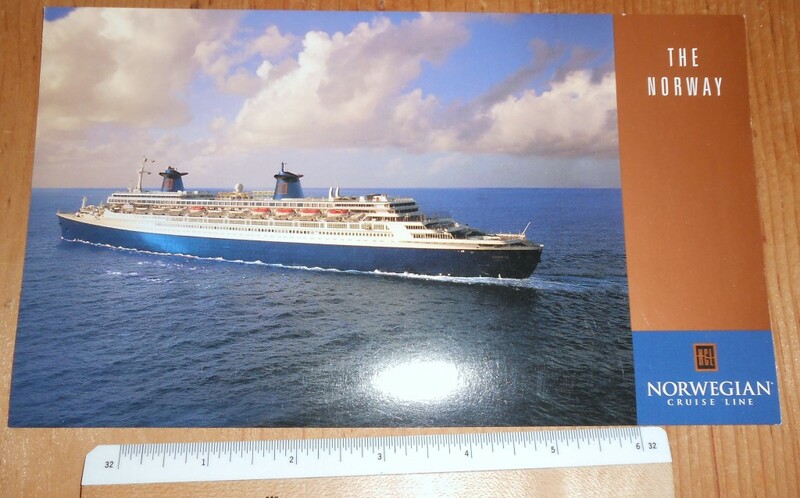 SS France: A wonderful brochure for the the French four funnel Chateau of the Atlantic! How does it get better this? The baby is crammed with pictures of public rooms and detailed information about them. Did I mention this is in almost new condition? .. just a slight crease on the upper cover corner. WOW! Grab it quick! Oh these French Line lists are great! This is from a 1953 voyage and covers First Class passengers. I’ll let you look through the names …could be somebody famous listed! She was a popular gal on the Atlantic. Excellent Condition. 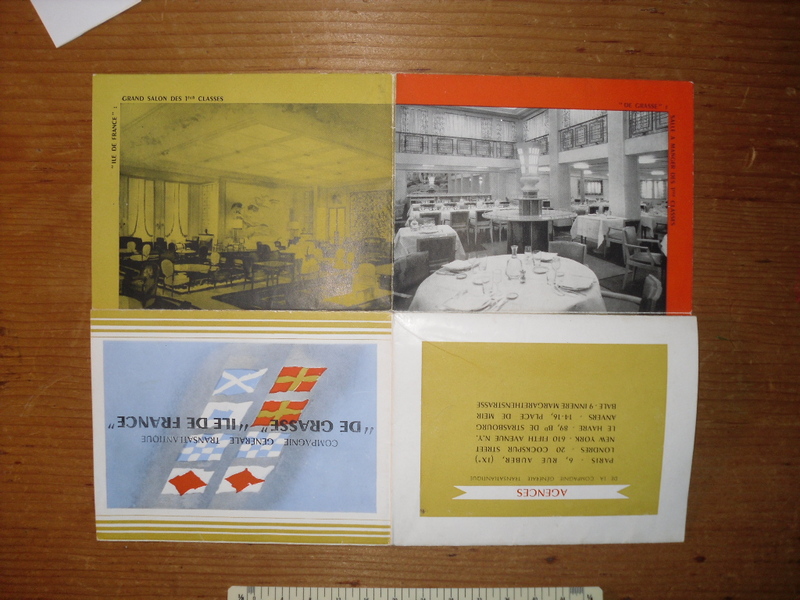 Early post card sized foldout that unfolds into 16 frames (8 frames per side) showing mostly interior images (14) of the De Grasse and Ile de France. 2 of the other frames show ship profiles and statistics. The remaining 2 are the front and back covers. In French. 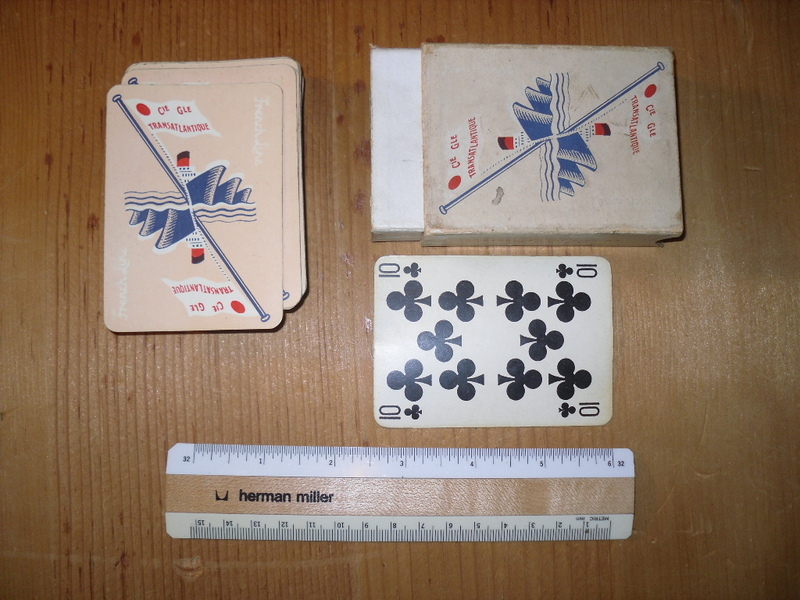 Good condition with some fold marks at the seams. 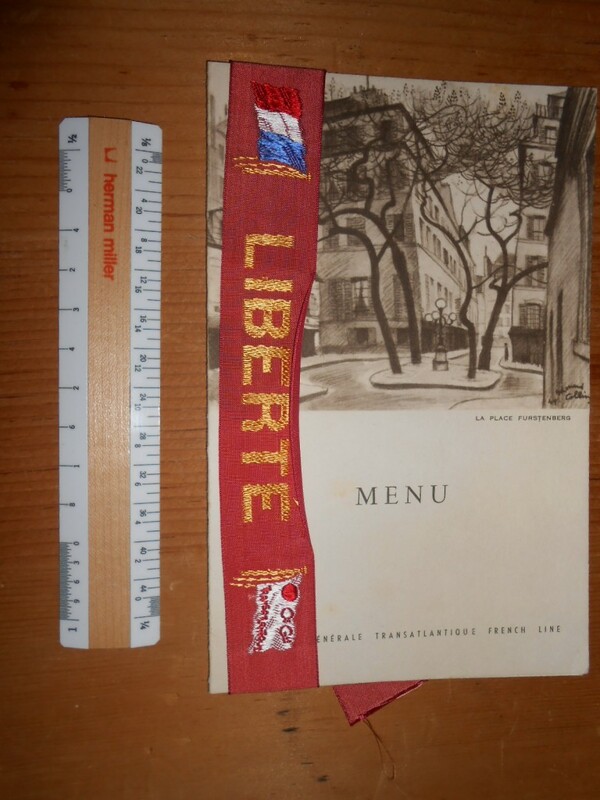 Oh the Liberte … viva la france! Here is a pristine introductory brochure for her…. packed full of interior renderings and a center spread profile by the master painter Marin Marie. 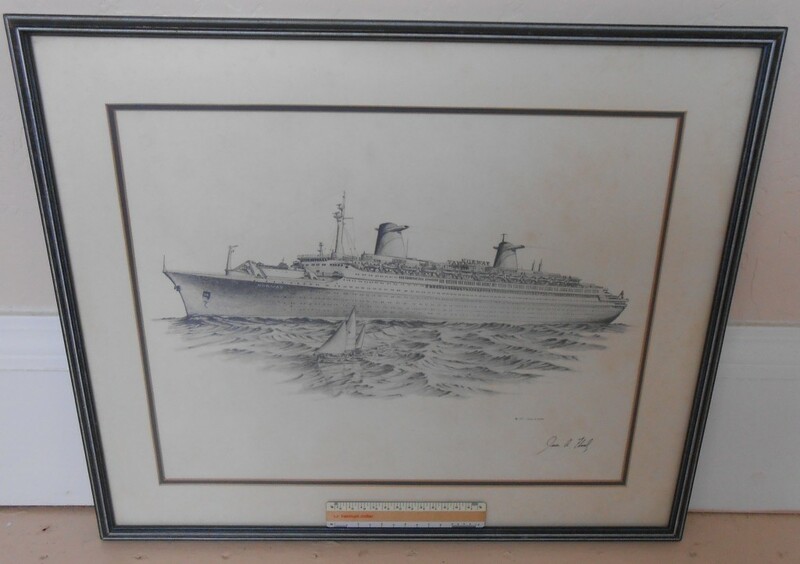 Renderings cover all classes … exceptional condition!